I’m not ready to have them bronzed quite yet. But maybe I’ll have to, especially if they become symbols of international diplomacy and Rodman wins the Nobel Peace Prize. Rodman is making news by playing basketball jester/diplomat to North Korea’s Kim Jong Un on the dictator’s 31st birthday this week. It’s one of the few times Kim has let the world see him, as the saying goes, with his hair down. It also makes Rodman more effective than the CIA– at least when it comes to North Korean intelligence. Despite appearances, Dennis Rodman and intelligence aren’t necessarily mutually exclusive terms. And some Washington observers, such as Georgetown professor Victor Cha, are even keeping an open mind about what might come out of Rodman’s antics. Especially if it can help out Asian American Kenneth Bae. Of course, everyone knows Rodman, the retired NBA star. But Bae? He’s the one without the nose piercings. The one in prison garb. Bae is the Asian American missionary from Southern California, who has been held in captivity by the North Koreans for more than a year–the longest period since the Korean war. 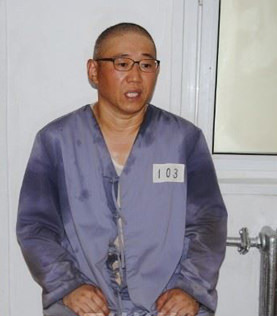 If you missed the story about Bae’s arrest in November 2012 for supposedly being a threat to the North Korean regime, his subsequent incarceration and conviction last May, or his mother’s visit to North Korea this past December, that’s all right. Bae’s plight is one of the most under-reported stories out there. Just like the regime itself. Essentially, he’s just a bargaining chip, until the regime wants something bad enough. Rodman? Nah, they get him cheap. But just add Rodman into the mix, and suddenly Bae’s despair is news again. That’s Rodman’s value as a rubbernecker’s dream. As you drive past, you can’t help but look at the accidental openings his actions create. So when Rodman gave an exclusive interview to CNN’s Chris Cuomo Tuesday morning, it was bound to be interesting. Was he being used by Kim? Cuomo pressed Rodman on the regime’s human rights record, but Rodman got defensive. He is at least aware of the criticism he’s getting for playing pick and roll with a despot. That door is still shut closed, especially for Bae. And when Cuomo questioned whether Rodman had asked his friend about Bae, the athlete known as “The Worm” squiggled with rage. “Do you understand what he did in this country?” asked Rodman. This is where Rodman’s foot was clearly on the line, and we can all blow the whistle. No longer was he a dumb jock. Now he was defending his unusual basketball patron, the ruthless dictator. Even Bill Richardson, who has been successful in helping people held captive by the North Koreans, said Rodman was out of bounds. Richardson called Rodman and his comments “wrong and inappropriate” by even implying that Bae might be guilty. Of course, Richardson knows about drinking Kool-Aid. He drank the wrong batch when, as Energy Secretary, he badly bungled the case of Wen Ho Lee. You’ll recall that Lee, the Los Alamos nuclear scientist who was accused of being a spy, was later exonerated. So Richardson isn’t 100 percent perfect in telling his spies from non-spies. But his record on North Korea suggests he knows a little more than Dennis Rodman. If Richardson doesn’t, the professional diplomats had better start practicing their jump shots. Still, I don’t want to think Rodman is just innocently playing ball. He does shine a light on the regime. And as long as we can separate what’s real from what’s propaganda, it’s still worth it–for Kenneth Bae’s sake–to see if Rodman’s more than just a sideshow and maybe even creates an avenue for hope.